Not all pies are sweet, as this unique recipe demonstrates. It is a savory pie with tender leeks, onions and scallions in a scrumptious cheesy custard base. The flaky double crust gives you two layers of buttery flavor that your whole family will enjoy. RecipeSavants.com Not all pies are sweet, as this unique recipe demonstrates. 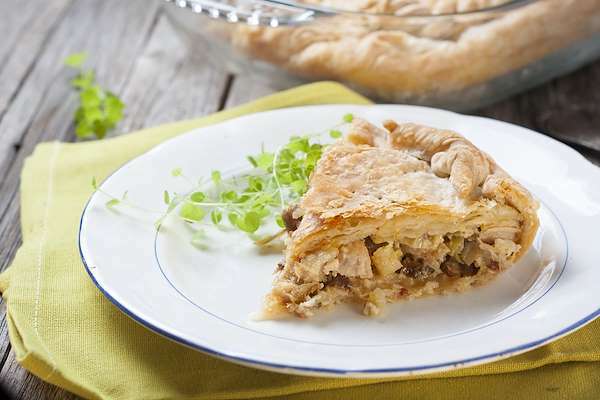 It is a savory pie with tender leeks, onions and scallions in a scrumptious cheesy custard base. The flaky double crust gives you two layers of buttery flavor that your whole family will enjoy. Smart Recipes, American Recipes, Dairy,Eggs Recipes, Recipes Dairy,Eggs American Cheese & Leek Pie PT1H20M Serves 6 Ingredients: 2 Pounds Leeks 1 Storebought Double Pie Crust 0.5 Cup Parsley 0.5 Cup Scallions 1 Large Red Onion 0.25 Cup Olive Oil 0.5 Pound Pecorino Romano Cheese 0.5 Pound Sharp Cheddar Cheese 6 Large Eggs 1 Teaspoon Salt & Freshly Ground Black Pepper In a medium saucepan over medium-high heat, add the vegetables and stir until most of the liquid has evaporated, about 10 minutes. Add 2 tablespoons of olive oil and seasonings, then remove from heat to cool. When the mixture has cooled, stir in the eggs. Layer 9-inch pie pan with a phyllo pastry sheet and top with the leek mixture. Sprinkle the top with the shredded cheese and top with another layer of phyllo pastry. Drizzle the top with the remaining olive oil. Bake until crust is puffed and golden brown, about 1 hour. Cool before serving.